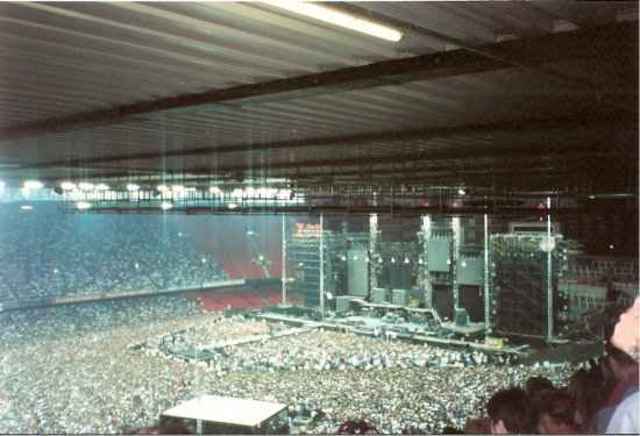 This was my first U2 concert,and absolutely blown away,I now feel so privalidged to have been part of the Zoo Tv Tour.I can still feel the spine tingling senses running through my veins when I think of Bono rising up on the lift in front of the eurostars at the beginning of Zoo Station,then The Edge's Guitar ripping through the stadium!!! Adam's Bass on New Year's Day thundered through me,rocking my bones almost....Awesome. But of all of the moments,the best for me is the 'White Out' at the beginning of Streets.The entire stadium was lit up,and the cheer od 50,000 fans at that moment......THANK YOU U2! I have included a picture just moments before showtime.